This elegant, comfortable space does double duty. It might be an interior designer’s instinct to put her stamp on everything when she moves into a new house, but when the house is being sold by a like-minded designer and friend, the to-do list gets a lot shorter. “It was a beautiful shell that we could move right into,” designer Tracy Morris says of the townhome she and her husband, Justin Li, bought last year in the Hamptons of McLean community. The seller, Theo Thompson, had already renovated the 1988 home with contemporary paint colors and trim, dark-stained flooring, and new tile, cabinetry and countertops in the kitchen and bathrooms. Morris didn’t touch any of it. She did, however, have some ideas about the small dining area, which sat at an intersection between the living room and a hallway leading to the family room and kitchen. She wanted to define the space and its functions so it would be more than just a pass-through. “In this type of house, it’s never going to be a massive dining room. We wanted to make the space a bit more convertible,” she says, adding that she often works at the dining table. Noting the scale of the space, Morris replaced a “massive, black-iron chandelier” with an airier lighting fixture and opted for a small table that left room for a sideboard, which she needed for storage. Anything too big or heavy wouldn’t have worked, she explains. Unfussy chairs and a sisal rug create a casual, approachable look, and a lamp on the sideboard lends a study-like vibe. 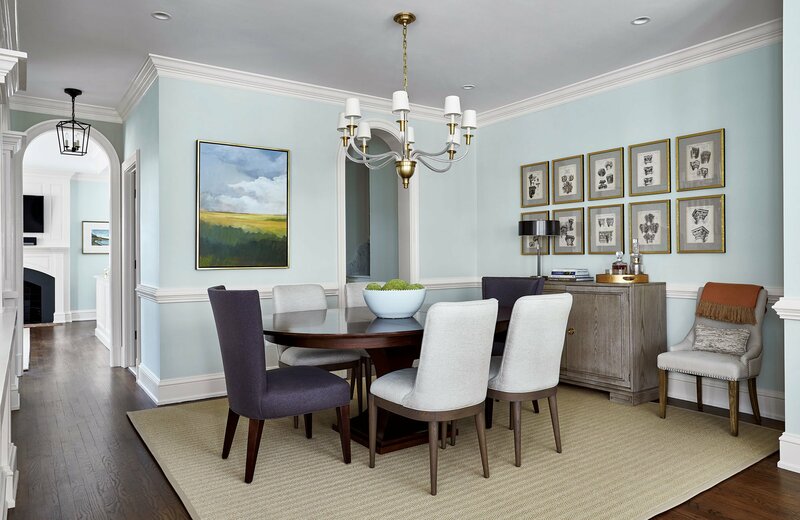 “Most people don’t use formal dining rooms any longer,” Morris says.